If you can't get to New Orleans, bring New Orleans to you with my recipe for homemade traditional style Shrimp Po Boy or Eat at Joe's! I have many wonderful memories specifically tied to the scents and tastes of certain foods. So many to share, but for now I will just share my latest trip down a food filled Memory Lane. This will require us to travel back in time to the Summer of ’08 and the journey of a lifetime that traversed over 7,000 miles across America. We had always joked about getting in a car and driving to Florida, I never thought the day would come when we would actually do it. Tom Waits was performing and the closest tickets we could get were in Jacksonville. Jacksonville, Florida. And so the master plan began to unfold, we would drive straight to Florida and back. Little did we know Mother Nature would have a say in the route we took to get there. Turns out that the route we had planned on was being hit hard with the Midwestern floods, in fact several of our Highway routes were closed off due to the flooding. Add to that our last leg of Kansas into Oklahoma was driven trying to outrun the giant black thunderhead cloud that was dropping tornadoes left and right. When we arrived in Oklahoma we were shaken by the high winds, lightning and hail… and the hotel reception desk didn’t ease our worries any further as they told us about their tornado alarms and how to get to the storm cellar… which was just beyond the “All-You-Can-Eat Breakfast Buffet”, which we could enjoy if we survived the night. Awesome. After staying glued to the satellite radio and keeping it only on the Weather Station we ended up heading straight south and into Texas. I will just say now that I will not ever complain about Seattle drivers after experiencing a rush hour drive through Dallas/Fort Worth. We pushed on for Louisiana, and as night fell we asked our trusty GPS to guide us to a night of rest in the swamplands. Our hotel was hot. It was humid. It smelled like it too. So while we were there and looking over the map I made the executive decision to make a stop off in New Orleans and have a couple days of rest and relaxation from the road. This decision turned into one of the most memorable highlights of our trip. We splurged on a room on Bourbon Street with a private balcony overlloking the courtyard where the sounds of Jazz blew in & lingered like ghosts in the early evening. After many consecutive nights in different towns sleeping in a different flea bag hotel each night I had decided that we deserved to splurge while in New Orleans, so I booked us a room at the Royal Hotel Sonesta. 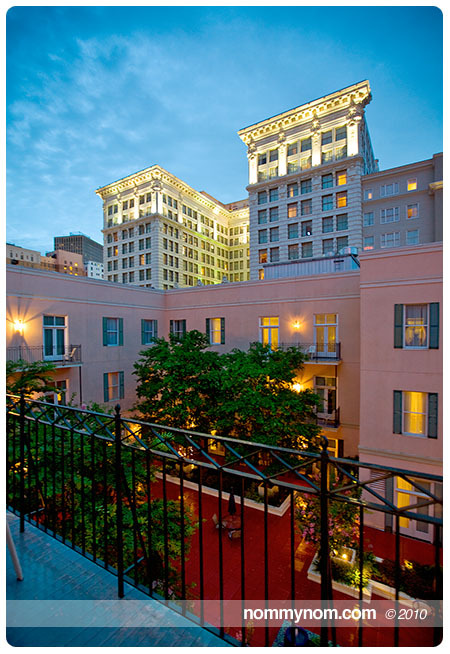 The location was perfect, in the heart of the French Quarter right on Bourbon Street. Walking out on our balcony the soft sounds of live Jazz being played in the bars and on the street wafted up piggyback on the scents of crunchy Softshelled Crab, spicy Gumbo chock full of Andouille and succulent blackened Redfish. We ate. And we ate. And when we were done eating we ate some more. 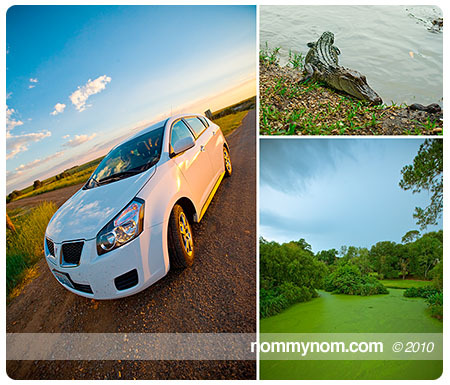 Memories of the road, alligators inspecting toes to nibble, neon green Louisiana swamps and so much more! On our last night it had occurred to us that we had not had a Po Boy sandwich! So we called down to the front desk, we were determined to have Po Boys despite the fact that we could hardly swallow air let alone a giant sandwich. Room service was closed for the night but they informed us that we could call up the Alibi Room, who had a late night menu and might deliver. So we called… and they delivered, and despite not having the room to stuff our faces, stuff our faces we did. The best food we had that whole trip was in New Orleans. Our brief visit in Lousiana left us with full tummies, memories of sipping Mint Juleps on Bourbon Street, Alligators wanting to snack on our toes, the gorgeous Tabasco Plantation and a longing to return. After many days on the road, and one too many gas station coffee stops, we were ready for our beautiful Seattle. Coming home after watching 7,000 miles of flat heartlands, swamps, ghettos, deserts, and towns you’d miss if you blinked while passing through… we longed for the lush hilly forests and jade green waters of Seattle. Coming home has never felt so good. So why all the reminiscing about New Orleans? That’s a good question, and I’ll tell you right now. 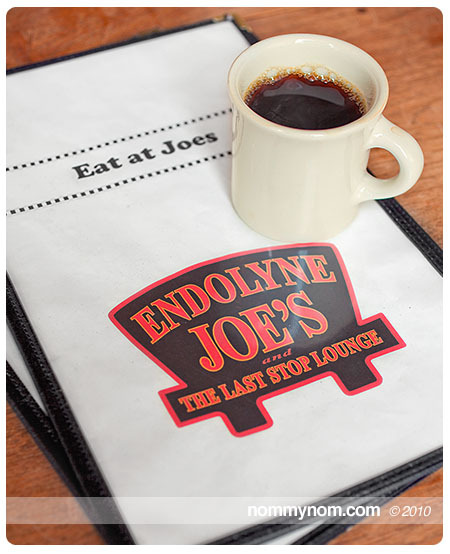 There’s a little place tucked up near the Fauntleroy Ferry Terminal in West Seattle, it’s called Endolyne Joe’s. They run a scratch kitchen and change out their menu every three months to fit a theme. I took my Guy and my Assistant out for breakfast because they have the BEST Biscuits & Gravy in town! Well, I walked in and I noticed that the theme changed to New Orleans… be still my beating heart! Endolyne Joe’s doesn’t just change the menu, but they change the decor as well. Staff paints pictures and doctors up the place inspired by the theme. When I say they have a scratch kitchen, that is to say they make everything from scratch right there in the exhibition kitchen. Don’t come expecting Haute Cuisine. The food is not fancy, it’s homey and it’s wonderful. You can actually taste the love in every bite. The people who work there are great. I’ve never had bad service in all the years I’ve been eating there, even when they are slammed they go out of their way to be attentive to their customers. When you eat here it feels like you are eating at home. 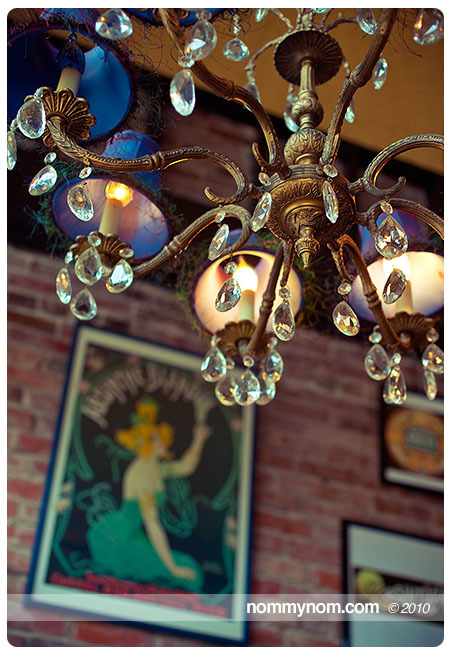 Charming mismatched wooden tables and chairs and worn hardwood floors add to the warmth of the service. If you’ve been and you’ve seen them on an off night, give them another chance, let them know and they will bend over backwards to see that you are happy. They are good people making good food. 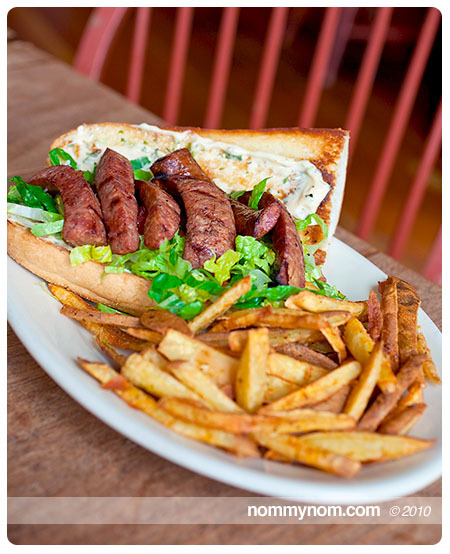 Travis makes the Andouille Sausage in house at Endolyne Joe's & they are put to good use on this mouth watering Andouille Po Boy with Creole Seasoned Frites. Along with our breakfast I ordered up an Andouille Po Boy. I hadn’t planned on it until our server Jake told us that the Chef, Travis, makes the Andouille in house. Well, of course I had to try that!!! When it came to the table all splayed open with glistening grilled pieces of sausage laid out on a bed of lettuce we all had to take a bite. I have to say that it was one of the best Andouille Sausages that I have ever put in my mouth, and I’ve tasted the real deal in New Orleans… Endolyne Joe’s has got it down. Eating at Joe’s is like coming home from a long trip away, the people care that you’ve come back and they treat and feed you well. I was sent home, taking a trip down memory lane. The scents and sounds of New Orleans. That last Po Boy our last night in the French Quarter. 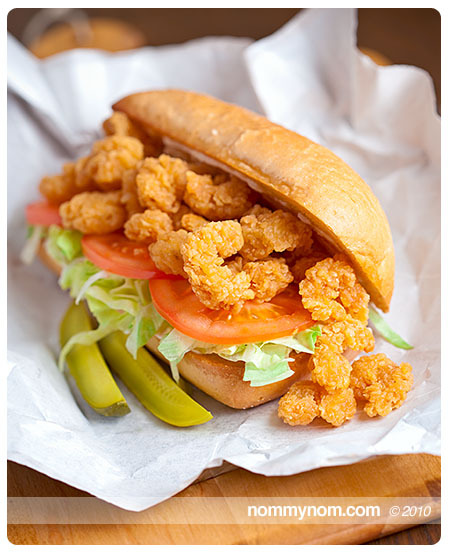 I left Joe’s inspired to re-create that last taste of NOLA and I’m going to share with you my recipe for a traditional style Shrimp Po Boy Sandwich that turned out to be just as good as the one I had back then. Dredge your shrimp in Bowl #1 and coat thoroughly, then dip into the liquid Egg Wash in Bowl #2, then quickly do your final Dredge in the Corn Flour and Flour mixture in Bowl #3. Carefully, drop your coated shrimp into the frying oil and cook just until they turn golden brown. Place shrimp on a plate set up with a paper towel to await sandwich assembly. Helpful tip: Do not overcrowd the pan, there should be space enough between the shrimp that they are not stacked or touching each other. overcrowding the pan will drop the temperature and result in soggy fried shrimp. Cut open your bread, leave it attached on the long side (like a hot dog bun). Generously spread butter on the inside, lay them open and give them a quick toast under the broiler, just until they are golden brown. Now you are ready for assembly! Slather some Mayonnaise on each side of the toasted bread, then pile on a generous helping of lettuce, followed by your tomato slices and finish it off with a giant heap of fried shrimp, slide a pickle spear alongside it. Serve it while it’s still warm and enjoy a little taste of New Orleans how I remember it! Mix it all together. Store or use immediately. Full disclosure: I have received no compensation from Chow Foods for this article. 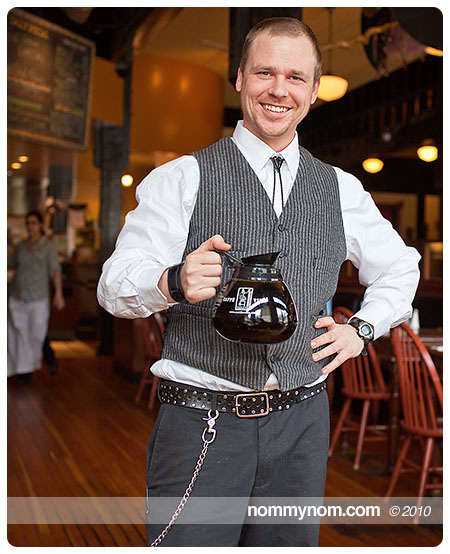 I just happen to be a fan of what they are doing over at Endolyne Joe’s. 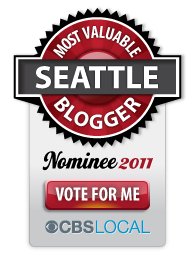 This entry was posted in Out & About, Recipes, Restaurants and tagged Chow Foods, Endolyne Joe's, food, fried, New Orleans, po boy, po boy sandwich, poor boy sandwich, recipe, Restaurant, review, sandwich, seafood, shrimp po boy, West Seattle. Bookmark the permalink. Thank you for sharing this. Please do this as often as you can! And love your images too. Kelly I could spend so much time looking at all of your great work and recipes. This will keep me busy for a while and give some new life to my cooking repertoire. Pretty Pies & I’m BACK! Kelly on Pretty Pies & I’m BACK! Diane Hawley on Pretty Pies & I’m BACK!